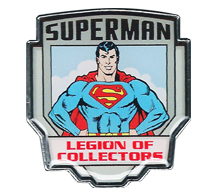 Here we go with another bootleg Superman item. This is a bag of a pair of Superman cartoon socks made by an unknown company. The only label on this package is a UPC sticker that says “cartoon socks $3.49.” With a design looking similar to that of South Park, “Superman” appears on these socks with googly eyes and brown hair. 1 day ago April 23, 2019 in BOOTLEGS.